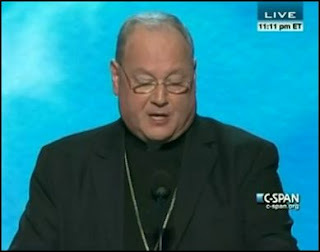 The prayers that Cardinal Timothy Dolan said at each of the National Conventions were significantly different. The audience responses were also different. Because I was in attendance, I witnessed the total acceptance of his prayer. 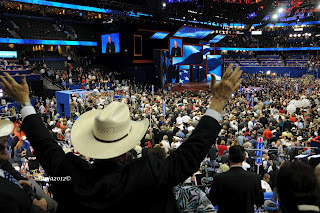 The photo above shows a Texas Delegate praying with his arms outstretched. The prayer for the Republican NC was shorter by about 30 seconds than the prayer for the Democrat NC. At the Republican Convention his prayer leaned toward the immigrant and in the spirit of moderation, Bless those families whose ancestors arrived on these shores generations ago, as well as those families that have come recently, to build a better future while weaving their lives into the rich tapestry of America. Help us live our freedom in faith, hope and love, prudently and with justice, courageously and in a spirit of moderation. After such a perverse DNC, I was surprised that Cardinal Timothy Dolan held his composure. But being a man of God, he is blessed with extra calmness. We should all get down on our knees and pray that God bless us with leaders who will guide us back to His path. As you can see Cardinal Dolan spoke to the DNC audience, and we can only hope that they understood what Cardinal Dolan was telling them. His prayer stressed the importance of human life and marriage between a man and a woman when he said that happiness is found only in respecting the laws of nature. He did not miss any of the issues that are so critical to Judeo Christian Americans as he added respect for religious liberty. Please take note that at the RNC, we prayed for the president, vice president and congress but names were not mentioned. Here are the differences in the DNC prayer. Help us to see that a society’s greatness is found above all in the respect it shows for the weakest and neediest among us. Renew in all our people a profound respect for religious liberty: the first, most cherished freedom bequeathed upon us at our Founding. Show us anew that happiness is found only in respecting the laws of nature and of nature’s God. Oh God of wisdom, justice, and might, we ask your guidance for those who govern us: President Barack Obama, Vice President Joseph Biden, Congress, the Supreme Court, and all those, including Governor Mitt Romney and Congressman Paul Ryan, who seek to serve the common good by seeking public office. 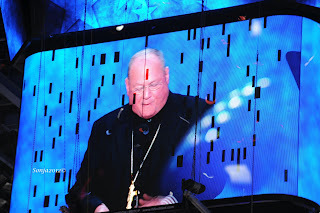 For those that might think that Cardinal Dolan is wrong in praying at the DNC, let me remind you that he is responsible in leading all souls to heaven. With firm reliance on the protection of divine providence, let us pray. Almighty God, Father of Abraham, Isaac, Jacob, and Jesus, we beg your continued blessings on this sanctuary of freedom, and on all of those who proudly call America home. We ask your benediction upon those yet to be born, and on those who are about to see you at the end of this life. Bless those families whose ancestors arrived on these shores generations ago, as well as those families that have come recently, to build a better future while weaving their lives into the rich tapestry of America. We lift up to your loving care those afflicted by the recent storms, drought, and fire. We ask for the grace to stand in solidarity with all those who suffer. May we strive to include your tired, your poor, your huddled masses yearning to breathe free in the production and prosperity of a people so richly blessed. O God of wisdom, justice, and might, we ask your guidance for those who govern us, and on those who would govern us: the president, and vice president, the Congress, the Supreme Court, and on all those who seek to serve the common good by seeking public office, especially Governor Romney and Congressman Ryan. Make them all worthy to serve you by serving our country. And help them remember that the only just government is the government that serves its citizens rather than itself. Almighty God, who gives us the sacred and inalienable gift of life, we thank you as well for the singular gift of liberty. Renew in all of our people a respect for religious freedom in full, that first most cherished freedom. Make us truly free by tethering freedom to truth and ordering freedom to goodness. Help us live our freedom in faith, hope and love, prudently and with justice, courageously and in a spirit of moderation. Enkindle in our hearts a new sense of responsibility for freedom’s cause and make us ever grateful for all those who for more than two centuries have given their lives in freedom’s defense. We commend their noble souls to your eternal care as even now we beg your mighty hand upon our beloved men and women in uniform. May we know the truth of your creation, respecting the laws of nature and nature’s God and not seek to replace it with idols of our own making. Give us the good sense not to cast aside the boundaries of righteous living you first inscribed on our hearts even before inscribing them on tablets of stone. May you mend our every flaw, confirming our soul in self control, our liberty in law. We pray for all those who seek honest labor as we thank you for the spirit of generosity to those in need [with] which you so richly blessed this nation. We beseech your blessing on all who depart this evening and on all those in every land who seek to conduct their lives in freedom. Most of all, Almighty God, we thank you for the great gift of our beloved country. For we are indeed one nation under God, and in God we trust. Dear God, bless America, you who live and reign forever and ever. Amen. For we are indeed “one nation under God,” and “in God we trust.” So dear God, bless America. You who live and reign forever and ever. Amen!